I'm always looking for ways to bring some reading fun to the holiday season. Things can get so busy, so working some ideas for encouraging reading into the holiday plan can make sure you don't get too busy for reading. 1. Check the events going on at your local library. Weekly story times often take a hiatus this time of year, but instead there's usually lots of holiday programs and activities going on. 2. While attending a special holiday event at the library, go on a hunt for some great Christmas books. Some libraries will mark the spines of their books to make special titles (like holiday titles) easier to find. 3. Do a reading advent calendar, like this one here. Have you seen this idea? Wrap 25 Christmas picture books (they can be ones you already own), then allow your child to unwrap one each day and read it together as you countdown to Christmas. 4. Make books a part of your gift-giving tradition. Unwrapping a cool new book or two on Christmas morning attaches the right connotation to books - they are something to be enjoyed! Some families make gifting a new pair of pajamas a Christmas Eve tradition; perhaps pairing a new book with their snuggly pajamas could become part of the tradition as well. Think about subjects your child is especially interested in, or books in a series they might be specifically wanting. We might be gifting some fun magazine subscriptions in our house this year! 5. Start a tradition of adding a new Christmas book to your family library every season. Make a special trip to the bookstore together to pick it out. Maybe get some hot cocoa while you're at it, and make a whole date of it! 6. If you do Elf on the Shelf, incorporate some reading fun into your elf's repertoire of tricks. Perhaps he will get caught reading the kids' Christmas books? Or perhaps he will get caught reading to some of your kid's toys, like in this photo? 7. Gift some fun items to your child that help encourage reading. We're giving neat reading lights to our kids to encourage them to stay up late in bed with a book. Another idea is the fun book timers for keeping track of their reading time (they are book marks that can be stored right in the book your child is reading). 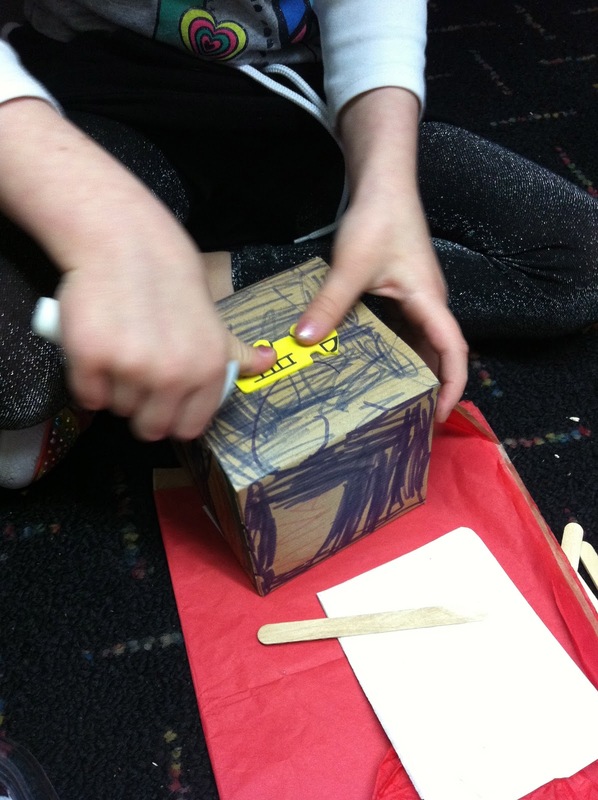 How about a kit for creating their own books? Or a fun bag for toting books to and from the library? 8. Give books as gifts to others with your child. How about for their teacher? Friends? Family? Ask for their input and help in selecting the right book for the people on your list this Christmas. 9. Make some festive sugar cookies with alphabet cookie cutters. Spell out festive words like "joy" and "merry" and then box them up and gift them to friends and family. Isn't this pretty? You could also make fun alphabet ornaments and gift tags using a variety of different supplies and things. Get creative! How do you encourage reading and literacy during the holidays? There is a lot of value in the pretend reading our little ones do before the real thing starts. It is an important pre-reading milestone! You can get an idea of your child's understanding of how reading works when they are pretend reading. Do they hold the book right? Do they understand where the words are that they "read?" Do they turn the pages the correct direction? Do they understand that it's the same story every time they read it? These are all important things for pre-readers to grasp in order for real reading to eventually happen. Reading to your child frequently and regularly will teach them these important print concepts and book handling concepts. Letting them "read" to you (or their friends, or toys, or whomever) will help as well. Use these pretend reading moments to ask questions if you can, gently guide them in how to handle the book... and to just revel in the adorableness of this milestone! As you can see below, my son has evolved through various stages of pretend reading. You can see his progression in the videos here below. It started out as with My Little Reader not really understanding much about book handling, or which way the pages turn or the text is read. He just wanted to "read" too! Then he began to understand that the print told the story of what was happening in the illustrations. But he still didn't have a handle on which direction you read the words, or even turn the pages. And then he understood that the story in a book was always the same every time you read it. He could remember and then retell the basic points of a story that he heard read to him once or twice. Now he can memorize, almost verbatim, most of a story after hearing it once or twice.He understands that it's not just that the story and ideas in the story never change, but that there are specific words in the text that tell the story exactly the same way every time. And he's now beginning to genuinely sound out and read some of the simple words in some books. In this video, he reciting most of the text from memory, but the rhyming words he is sounding out and reading. Does your little one like to pretend read? I would love to hear about it in the comments! 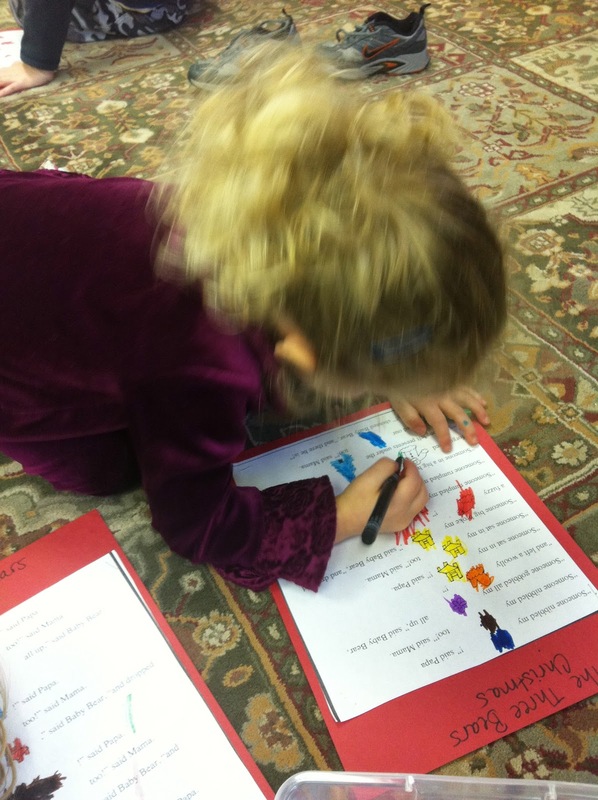 Each week at Literacy Launchpad we do an activity of some sort. Often it's a game that goes along with whatever literacy skill we are currently practicing, and often it's also a craft project that correlates with the story we read that week. 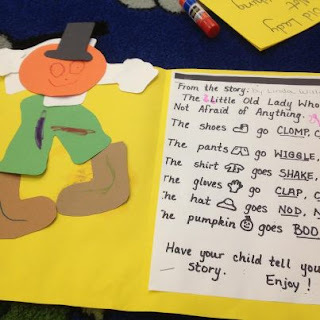 The idea behind the craft project is usually to give the students something fun to do that will help them remember the skill we worked on, and/or remember the story we read. It gives them a token to take home to be excited about and, to act as a conversation starter between them and their parents, so my students can share what they did in class that day. I have had some parents get confused about why I prep a lot of the parts of our craft projects. For example, they wonder why I might pre-cut the parts of a construction paper animal. The reason for this prep is so we have enough time to actually complete the project within our 30 minute time frame for class. Also, the point of these projects isn't to teach my students fine motor or art skills. If I get too hung up on that stuff, my students miss the actual point of the projects we do in class together. What I have discovered over the years of teaching Literacy Launchpad is that our class projects also serve as a catalyst for great class discussions. It's tough to keep preschoolers' focus for an at-length discussion of our story, but give those busy hands something to work on and they will chat and chat and chat! The ideas and opinions they will share - amazing! The projects serve as a great jumping off point for lots of great discussions about the week's book, or about the skill we're working on. The best is when the discussions get really deep, or go in an interesting direction I didn't anticipate. So whether you're a teacher or a parent, consider a project to go along with your stories sometimes. But don't let the process of the project itself become the focus, use it as a way to get your kids thinking and talking! Keep the wheels turning as they are gluing and coloring and arranging... And see what brilliant ideas your kids start sharing! 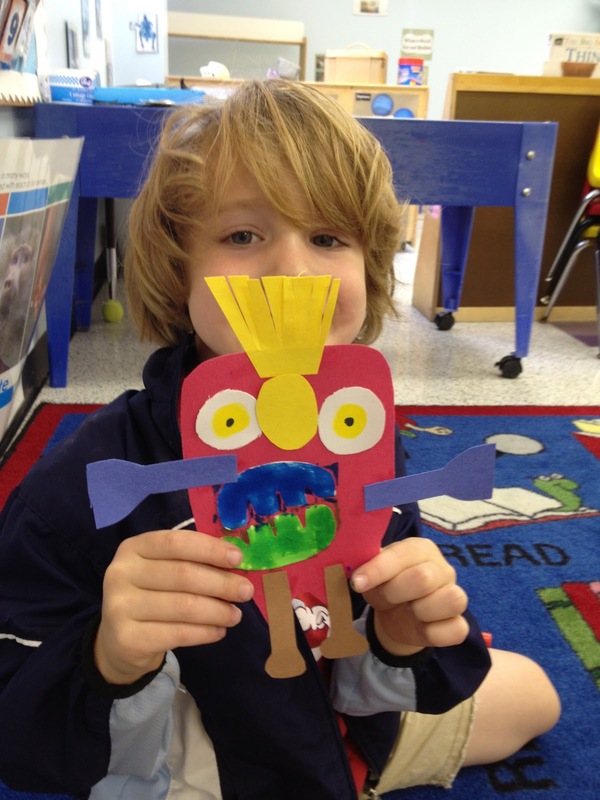 What are some of your favorite projects that go along with stories you read your kids? My Literacy Launchpad students love a good spooky story... or a not-too-spooky story in this case. This month we learned about story structure and beginning, middle, end as we read some stories that had a hint of spook to them. The month started out with some Creepy Carrots (Aaron Reynolds). What happens when a greedy little rabbit takes too many carrots from Crackenhopper Field? The carrots from Crackenhopper Field start following him and creeping him out... or do they? Is it just Jasper Rabbit's imagination? This one was the favorite for the month by a lot of my students. I loved reading it aloud, which was great because they asked me to read it many times over the course of the month! 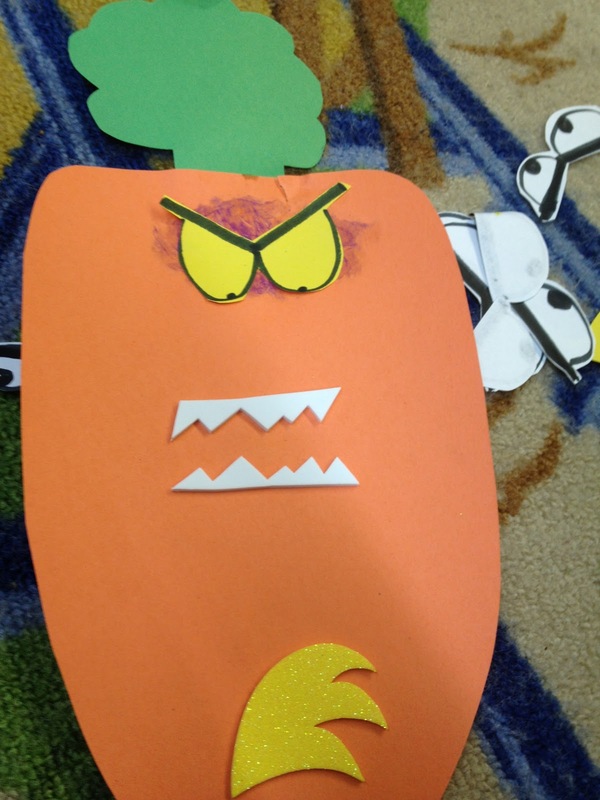 It's fun to vary my tone, volume, and inflections for dramatic effect with a spooky story! We did a lot of practice with arranging the parts of Creepy Carrots in order - beginning, middle, end. The kids seemed to catch on really quickly to this concept. We made a poster where we broke up the parts of the story into beginning, middle, end. Then we made our own creepy carrots to take home with us, and put the parts of the story in the correct order on the back. The next week we read Go Away, Big Green Monster (Ed Emberley)! Another hit with the kiddos! We read this one many times too! We played a game called "Monster Stomp" and then after our game we turned our classroom into a monster making factory. BUT... we weren't scared of our monsters. We could make them go away whenever we wanted. Plus, some of them were nice, friendly, smiling monsters. We continued to talk about story structure as we read The Little Old Lady Who Was Not Afraid of Anything as our last story of the month. This read-aloud was hysterical, because I got some big jumps out of the students when I read the "Boo!!" part of the story to them! Every time! I love that. 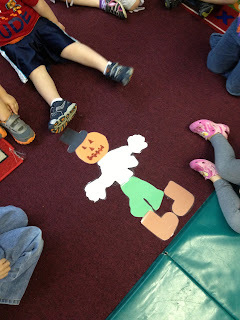 We had to remember all the parts of our story as we played a game where we pieced together the scarecrow from the book. We had a lot of laughs with that game, and got our scarecrow put together all handsome... errr scary! Then we made our own books. We had to remember again all the parts of the story, but we had the words in our books to help us. And now we can take our books home and make our friends and family jump when we read the "Boo!" part to them!